Nurses have been taking on the work of doctors. Now they are looking at how they might pass certain responsibilities down the healthcare chain. The role of nurses is rapidly expanding. They are running their own clinics, prescribing drugs and taking on the work of managers. Next week, the Royal College of Nursing meets to discuss key issues, including devolving work to health care assistants to free up more time for treatment and technical nursing. The RCN estimates that 20% of junior doctors' work could be shifted to nurses and over 12% of nursing work could be shifted to health care assistants (HCAs). It believes this would help with current staffing shortfalls within the NHS. The 2002 Wanless report predicts that an additional 74,000 health care assistants, on top of the existing 350,000, will be required over the next 20 years to address the mismatch in supply and demand for doctors and nurses. This is compounded by the European Working Time Directive. From August 2004, junior doctors will have their maximum working week reduces to 58 hours under the directive. By August 2009, the maximum working week will be 48 hours. Nurses are now doing similar work to GPs. Clinics and walk in centres are run by nurses. Nurse consultants are working with junior doctors. RCN Executive Director Liz Hewett said: "There is absolutely no reason why certain aspects of nursing care cannot be delegated appropriately to those who may not be registered as nurses providing that they are properly trained and properly supervised when they are undertaking these delegated tasks. "Recruitment and retention is such an ongoing and serious issue that new and innovative ways to deliver care to the increasing ageing population...are absolutely critical." The RCN hopes to receive the support and backing of the Health Secretary for greater nurse empowerment and opportunities. But there are concerns about regulating any work delegated downwards. Nurses are regulated by the Nursing and Midwifery Council, much like the GMC for doctors, and can be struck off for misconduct. HCAs have no such regulating body. 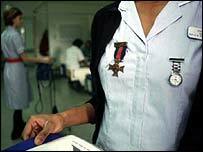 An RCN spokeswoman explained: "HCAs are non-regulated staff so devolving the power down to them is complicated. Hand in hand they would also have to go about regulating them as a body." A spokesman from the Nursing and Midwifery Council said: "At the moment you can't have HCAs taking on those roles unless they are regulated. It's a matter of public protection. In the future you may have better trained HCAs who are capable of taking on some duties but we are certainly not there yet." The government is looking into the possibility and has produced a consultation document - Enhancing Public Protection. The consultation period ends in July. But the BMA gave a work of caution. "All health care professionals, including doctors, should be aware of the limits of their competence and practise within those limits." The congress theme is "speaking up". Delegates will discuss how nurses can get their voice heard within the health professions and health sectors. Results of a MORI poll are also expected. The poll asked RCN members whether recent investments in the NHS have translated into tangible benefits for patients. Other hot topics to be covered include tackling violence against staff, pay modernisation and international nurse recruitment.